When Sadie Hoffmiller sees cops pull up to her neighbor’s house, she goes over to help the police enter the house and learn what’s going on. A lemon tart is baking in the oven, but no one is home. Then, after further searching, the body of Anne Lemmon is found in the backyard. Anne’s two-year-old son, however, is nowhere to be seen. I love the idea of a housewife/homemaker who is also a private investigator. 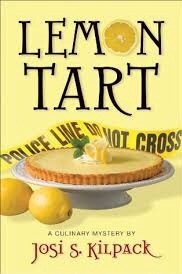 This is the first book in the Culinary Mystery series by Josi S. Kilpack, so I don’t know if she ever officially becomes an investigator or just muddles around collecting clues. Here, however? She goes about collecting clues, either without thinking about contacting the police or blatantly and deliberately not telling the police. I also have mixed feelings about Sadie’s character. Widowed when her children were young, she was breadwinner and homemaker all in one. We learn late in the book, in a single sentence, that she taught school, and yet at fifty-five she is already retired and well-off. There’s also mention that her husband’s life insurance left her well-off, even though he died when the children were little and the life insurance would likely have run short of her own personal retirement. Whatever the ill-defined reasoning behind her stay-at-home empty nester status, she is a homemaker through and through, baking up homemade alfredo sauce and brownies and so many delightful edible things. She also judges other people’s choice in personal decor and is a staunch conservative, so much so that the author has to mention things like, “I love this composer, but none of his anti-war stuff. I’m a patriot.” Or telling a neighbor that he’s an anarchist because he doesn’t believe we should be at war. These sorts of things are peppered throughout the book and, frankly, make her less likable, not more. The mystery itself is really intriguing. A single mother dies and her toddler is missing. Who killed her? Where is her son? (This point is not stressed in the story nearly enough. If there were a missing two-year-old in my neighborhood, I would be frantic about him from minute #1, if not second #1) There are also plenty of red herrings, all plausible and each more convincing than the last. In fact, by the time the true culprit was revealed I was almost disappointed. It wasn’t who I would have thought, with a weaker motive than any of the other suspects. At least, in my opinion. Finally, to my delight, at the end of each chapter that mentioned a homemade dish, there was a recipe. As in, I now have access to lemon tart, alfredo sauce, “make up” brownies, and so much more. I may or may not have squealed when I discovered the first recipe. Will I read any more of the Culinary Mysteries? Perhaps. I just hope that Sadie becomes a more sympathetic character. With a third person limited narration, it’s a bit annoying being in her head.